Analysis of VIDEO SHOT OF UFO AT WORLD TRADE CENTER PRE 911! 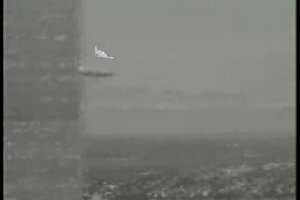 ANALYSIS OF VIDEO OF UFO AT WTC PRE 911! No clear signs of Digital manipulation! Opinion on authenticity of video file known as WTC UFO. I am the lead special effects creator for Adoni Productions and Adoni Films. The video was clearly shot in one take where a 180-degree view of the Manhattan skyline was shot from inside a helicopter. At various times throughout the video, the helicopter rolls from side to side, the skyline is observed in a manner consistent with a live shot. As the camera moves or zooms in on an object there is no clear manipulation of the video through a digital effect. Objects remain consistent with a live panoramic sweep outside and inside the helicopter. There is no evidence of editing this shot, as to splicing together multiple takes or digital creations. The sound is synched perfectly to the video. Certain anomalies appear in the frames that are consistent with an auto focus home use video camera. The camera used was not a professional level video camera in my opinion, although it did work out very well for this shot. The shot starts off with a north westerly view of the Manhattan Skyline in which the World Trade Center is clearly visible. A small object is viewable near the North Tower at the approximate height where the second plane crashed into the WTC on 911. 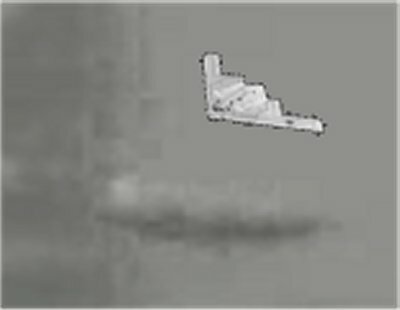 Once the small object appears on the screen, the female in the video asks what is that while pointing to the small image near the WTC. The cameraman zooms in and a UFO is seen hovering near the WTC. Normal auto focus anomalies appear in the frames due to auto focus stabilization abilities the camera obviously has. The UFO then heads easterly in front of the helicopter, a blurry sequence of frames then appear with blurred images of objects inside and outside the helicopter. These features are consistent with a continuous live shot made in one take, it would be impossible to correctly blur every object inside and outside the helicopter if this was a created effect. While such a move could be created by a high priced studio, tell tale signs of editing such a created sequence would be obvious under high resolution. Such created scene anomalies are not in this sequence of events. High Resolution analysis of created video or digital effects using even advanced equipment that is available, all show a clear drop into a scene where an object materializes. At normal viewing speeds these anomalies are not viewable. And they do not appear in this video. 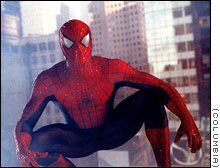 Here is a dropped in image from Spiderman using THE LATEST GREATEST DIGITAL TECHNOLOGY. It looks great! 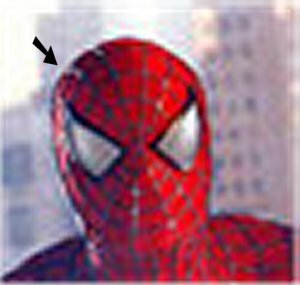 Yet, it is easy to see a change in pixelation as soon as you magnify the image a little proving the Spiderman image was dropped into the photo!! Again, this pixelation difference is NOT IN THE WTC VIDEO! The cameraman eventually relocates the image at a far distance viewing a north easterly landscape of Manhattan. Within a few frames the UFO heads to the front of the helicopter where an amazingly clear close-up of the UFO is taken! The UFO then heads right up into orbit. A view of the UFO heading into orbit is seen since the helicopter has a clear roof. To summarize, what this video displays is a panoramic view of Manhattan pre-911. It is a single shot one take view of the Manhattan skyline. It features a focused north westerly view of Manhattan including the WTC, a blurred northerly view of Manhattan, a focused north easterly view of Manhattan and finally a easterly view of the sky. 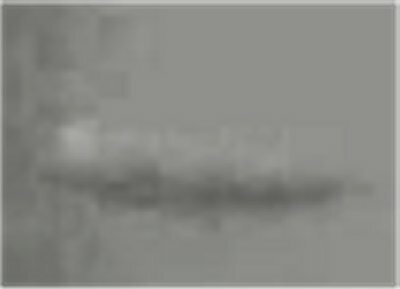 Super high resolution analysis of the UFO in many frames shows the outline of the craft has a pixelation degradation consistent with other objects in the frames. This match is impossible to get consistently in a digital manipulation. The dropped in object always has a different pixelation degradation at high resolutions compared to the background scene. 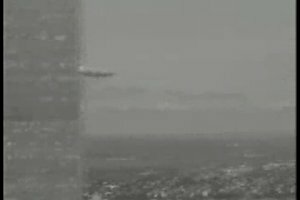 While someone could have theoretically taken a helicopter ride in Manhattan PRE 911 and pointed to the EXACT LOCATION where a future video would later be taken of a world famous airplane crash and then digitally dropped a fake UFO into hundreds of frames matching pixelation degradation perfectly in every frame. I doubt this was done or is even possible using the most advanced special effect equipment and computers available today. The technology to do this manipulation so expertly does not exist, or at least I have never seen or heard of such an advanced piece of equipment. Also, to have the shot match the target zone of where the second plane crashed, is just so far beyond the realm of chance, that I wouldn't even try to estimate how unlikely it would have been. In my opinion, this video is clearly an approximately 20 second - one take - one camera shot - of an object navigating at incredible speeds with such precision it can come to within feet of a target and do a 90 degree vertical turn! This video has no clear digital editing of images. This video has no clear digital special effects added to it. It is simply an amazing raw footage of a UFO at a now infamous historical location over the most famous city in the world! These are some samples of what I mean by High Resolution Pixel Degradation. This is a normal resolution of the UFO near the WTC. This is a high resolution close-up of the UFO and the object near it, the WTC. Note how the SQUARE PIXELS and even the color match perfectly. This is what I call pixel degradation. If an image is not altered then the pixelation of objects of similar distance have the same look at high resolutions. Now here is stealth bomber model I dropped into the photo. As soon as I view it at high resolution the drop in image does not match the surrounding pixelation degradation. If this video is fake, I'm sure either Spielberg or Lucas will offer the person a partnership and the video should win an Oscar for Special Effects. Our advanced but limited technology cannot fake such an video this perfectly yet. New Article Did Universal Studios PRODUCE this Video?